I know that if I’m going to win my family over on this fermenting thing that it’s going to be a little at a time and that I’m going to have to start with things they already love. So, in addition to sauerkraut. I’ve been fermenting peppers. And guess what? They love them! The fermented peppers don’t have a vinegar taste that pickled peppers do and the fermenting seems to make the pepper a little spicier. While making sauerkraut is easy, fermenting peppers is super easy. 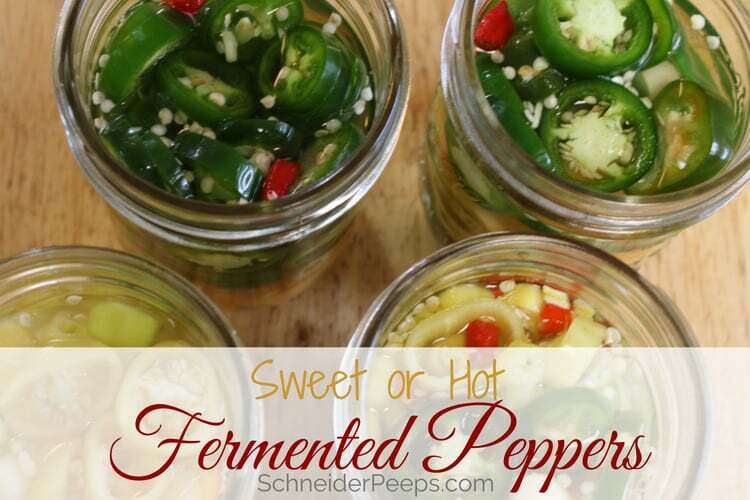 All you need is peppers, salt, water and something to ferment them in. I’m using a wide mouth pint size jar and Fermentools lids. One thing I really like about mason jars for fermenting is that I can try different ferments in small batches until I find out what my family really likes. To make fermented peppers just slice your peppers in rings or long slices, the shape doesn’t matter. Also, if you are fermenting small peppers you can just leave them whole if you want. Make enough 2% brine to cover the peppers. This can get tricky and you can do math and weigh your salt and your water to bet a 2% brine. Or you can do what I do and just “estimate”. The idea is to have enough salt to inhibit mold growing but not so much that it halts the fermentation process. I’ve found that using 1 Tbsp of salt (I usually use fine sea salt or Himalayan salt) to 1 pint of non-chlorinated water works just fine. Put the peppers in your jar and pour the brine over them. Make sure you have some kind of weight to keep the peppers under the brine as they tend to float. 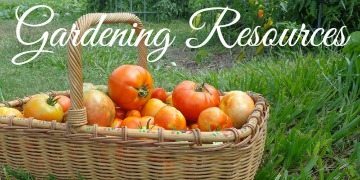 If any of the seeds float above the weight, just skim them off. Add lid and let the peppers ferment in a cool dark place for 5-10 days. Check your peppers every day or so. 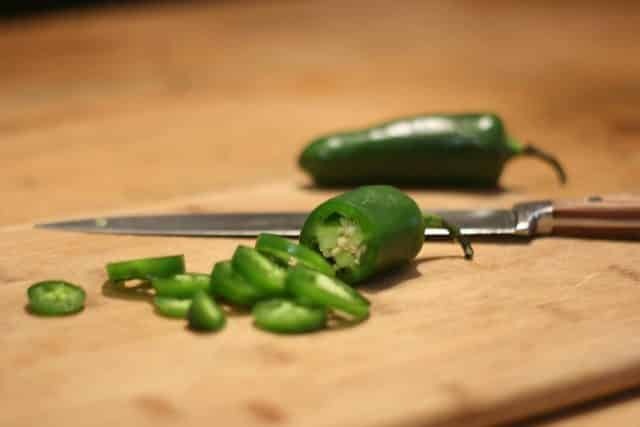 The fermenting process is more of an art than a science and there are many variables that will cause your peppers to ferment in just a couple of days or take up to two weeks. When the peppers are fermented to your liking, remove the fermenting lid and weight. Replace the fermenting lid with a storage lid and store in the refrigerator. 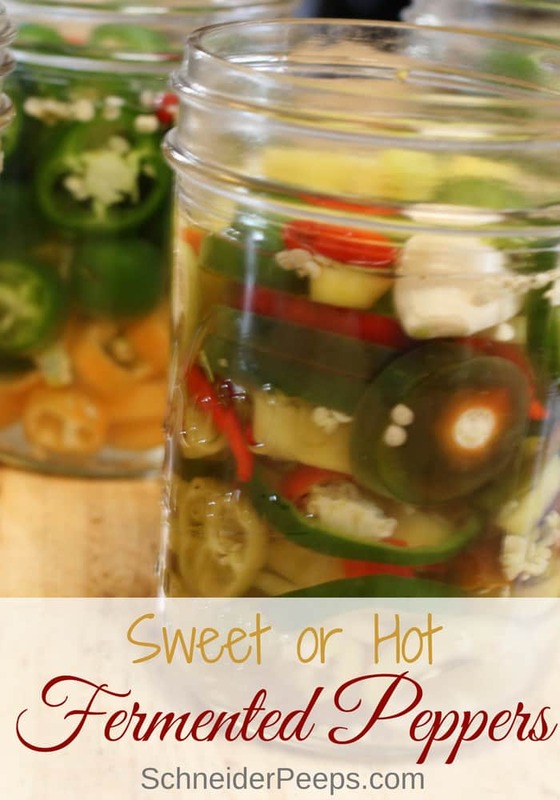 The process is the same if you are fermenting jalapeno peppers or sweet banana peppers. We like to mix the spicy peppers in a jar, so we usually have jalapeno, poblano, and cayenne peppers all mixed in the same jar. I don’t care much for hot peppers but I love pickled banana peppers so we ferment the banana peppers all by themselves. We also will usually add a garlic clove or two to the mix. You can use this process to ferment any pepper - both sweet and hot. Why make vinegar pickled peppers when fermented peppers are easier and much better for your gut health. peppers to fill a wide mouth pint mason jar - jalapenos, poblano, cayenne, banana, even bell peppers. Store in a cool, dark place for 5-10 days. Check your peppers every day or so. 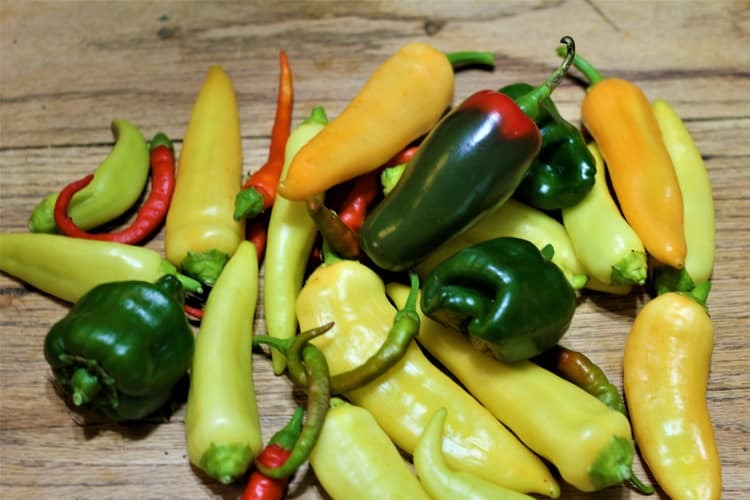 The fermenting process is more of an art than a science and there are many variables that will cause your peppers to ferment in just a couple of days or take up to two weeks. Once the peppers are sufficiently fermented, remove the fermenting lid and weight. Cover the jar with a plastic storage lid and store in the refrigerator. 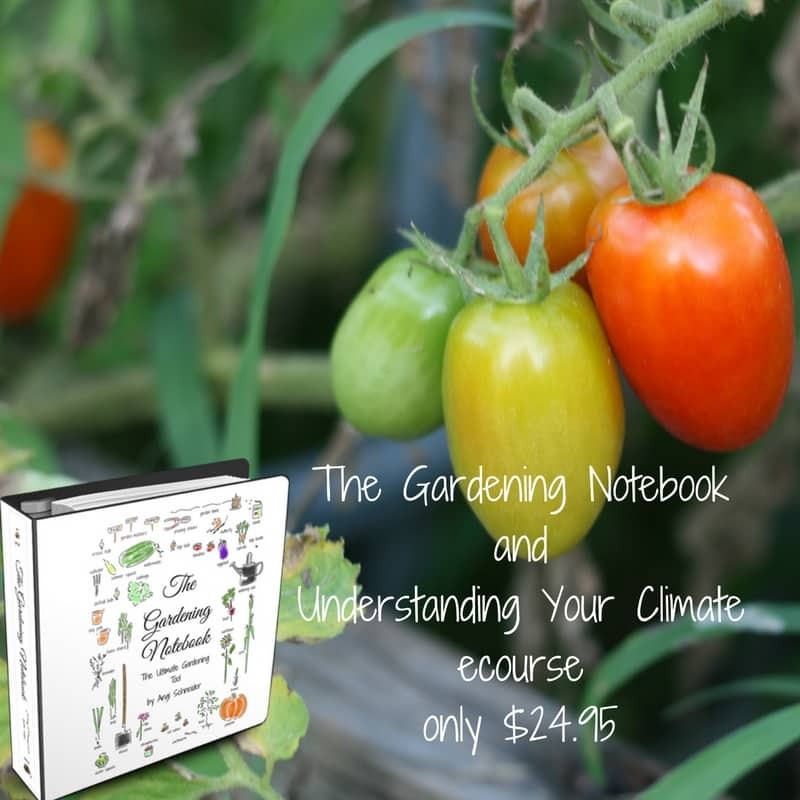 The Herbal Academy has a fantastic fermentation course available. You can learn how to make mead, herbal beer and wine, water kefir, and fermented foods. 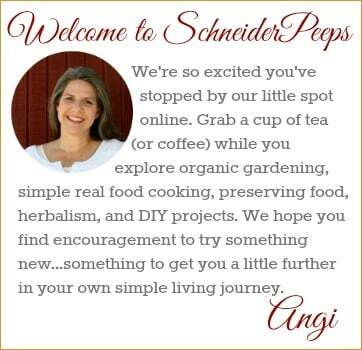 What have you been fermenting lately? Yummy! Are they the same flavor as processed jalapenos? And what have your favorites been? What’s the difference between canning and fermenting vegetables? Are all fermented vegetables vinegar-y tasting? 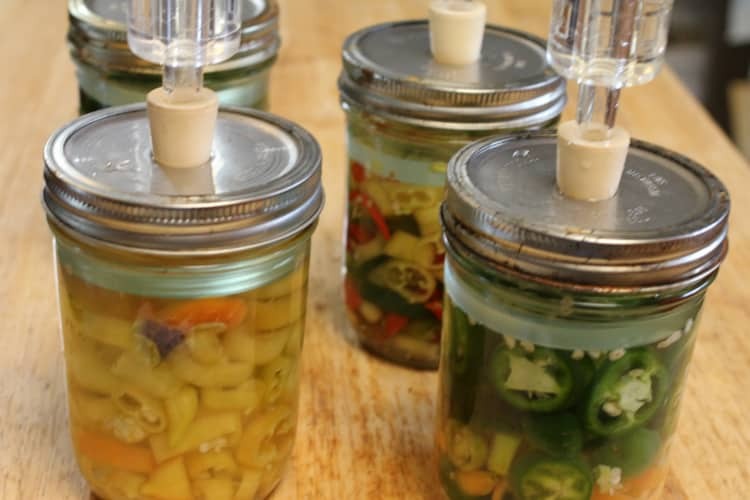 Canning is when you either use a pressure canner or water bath canner to preserve foods that are self stables and will last at least a year in the pantry. Many times large amounts of sugar or vinegar are used to help preserve the produce (esp. if you are using a water bath canner). Fermenting doesn’t use vinegar at all, so the flavor is not vinegar-y. Fermenting uses salt, water (or the liquid from the produce) and the naturally occurring microbes on the produce to preserve it. Fermented foods are not shelf stable and will need to be stored in the refrigerator, they can be kept for 6-12 months most of the time. Fermented foods are able to be canned in a pressure canner or water bath canner depending on the acidity level but then you destroy all the good enzymes and bacteria that you just grew. I don’t understand how to make the 2% brine. Hi Alice, You’ll need to weigh your water and your salt in grams (not ounces). If you have 400 grams of water which is about a pint of water, you will need 10 grams of salt to make a 2% brine. Hope this helps. Yum! My boyfriend HATES vinegar and it drives me crazy! Will definitely be trying this! Isn’t that crazy. My husband has brainwashed most of my children into hating pickles. I should have worked harder when they were little ;-). Hope you enjoy them! You can certainly use the metal lids and bands for ferments, just make sure there’s plenty of room in the jar and the ferment doesn’t touch the lid. Over time the ferment can actually break down the metal so you don’t want it in constant contact. Because I’m not the only one rummaging around in my refrigerator I prefer to just use plastic (either the plastic storage lids or the Tattler reusable canning lids with a metal band) and not worry about it. Hope this helps. I’m a successful home sauerkraut fermenter; that being said, I should have luck following the same basic recipe & process for peppers, right? Pretty much. You’ll need to add water to the pepper which you don’t have to add to most cabbage for sauerkraut though. I use a digital kitchen scale. I’m gram ignorant too! The process is truly simple, put the peppers and salt water in a sterile glass jar. Add a weight and a airlock system and you’re good to go. I bet your granddaughter would enjoy Fermented Vegetables by Christopher and Kristen Shokey. Her library probably has it or can get it for her. It will walk her step by step through the process of fermenting various vegetables.